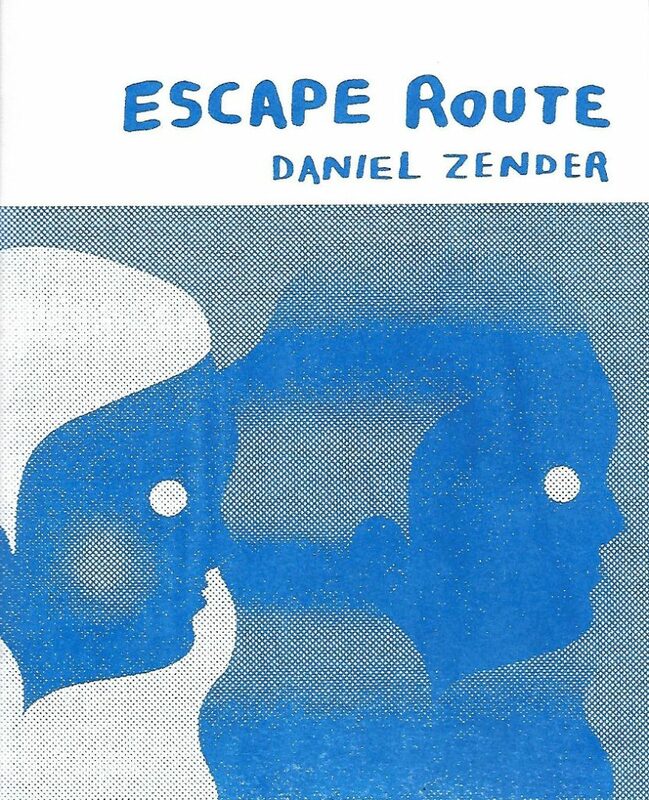 During CXC I picked up a stack of new mini comics from Uncivilized Press, including Escape Route by Daniel Zender. I’ve been slowly working through those books, but I’ve fixated on Zender’s work, which I’ve seen before in the New York Times. These illustrations are remarkable for the way Zender blocks out color and spaces, and the way these images integrate a granularity of tone that is reminiscent of spray paint and graffiti. There’s an overwhelming darkness to Zender’s art and illustrative work, and that carries through to Escape Route, a 28-page risographed comic from Uncivilized Labs, their experimental print line. As a comic that experiments with form, Escape Route doesn’t really have a plot. 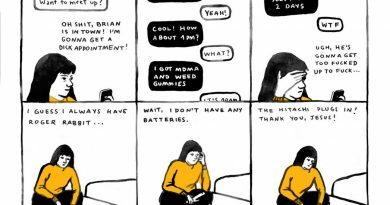 Action is more likely to be associated with a specific feeling or reaction from the reader’s perspective – and indeed, the comic constantly evokes a sense of wonder and dread. Skulls pile up at the feet of a woman who stares blankly at the reader; a sleeping person has flowers grow up around them; a person in glasses resurrects a dead bird. These individual scenes are linked by their intensity, not a main character. Reading a plot onto them might work for a page or two, at most, but then the whole enterprise dissolves into a dark mist. 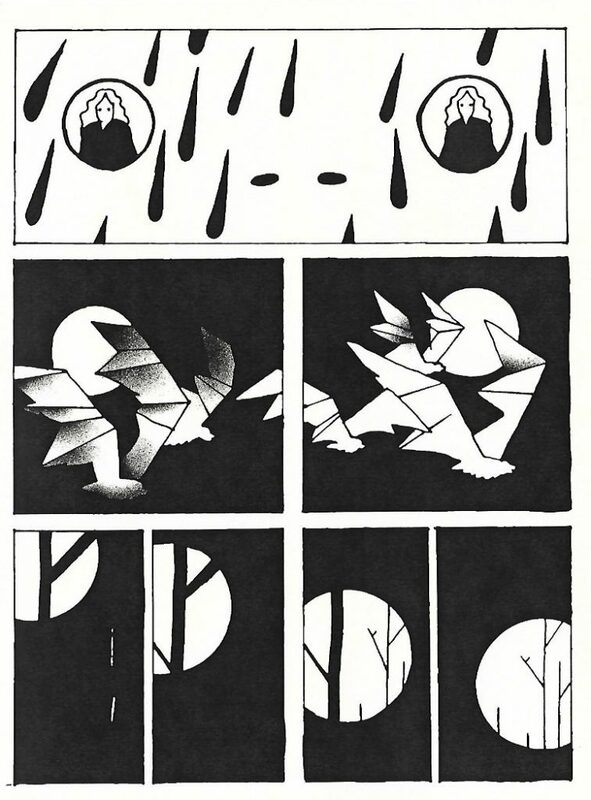 Density of tone, tonal shifts, granular detail, and repetition – these are the tools with which Zender layers meaning into these oblique comics. Repetition is likely the most powerfully realized tool that Zender uses in Escape Route. Entire sequences are repeated with minor modifications, giving the comic an almost musical rhythm. This repetition also forces the reader to engage with the work on a more technical level – the questions of what changed and why are the base from which other observations spring. The cover, blue ink on white paper, emphasizes that repetition. 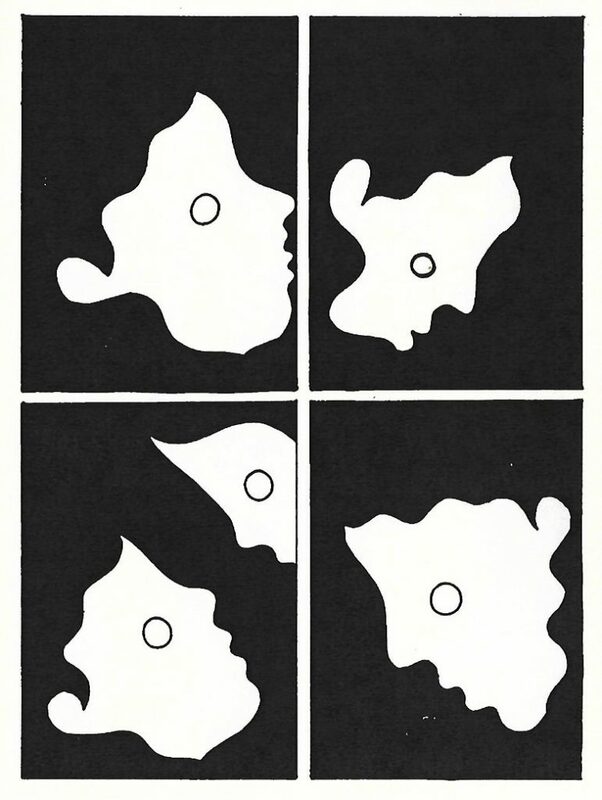 In some images, the changes are almost imperceptible, but in others, they completely change the context of the image. A good example is a set of heads in profile (I’ve sampled the image for you to see above). 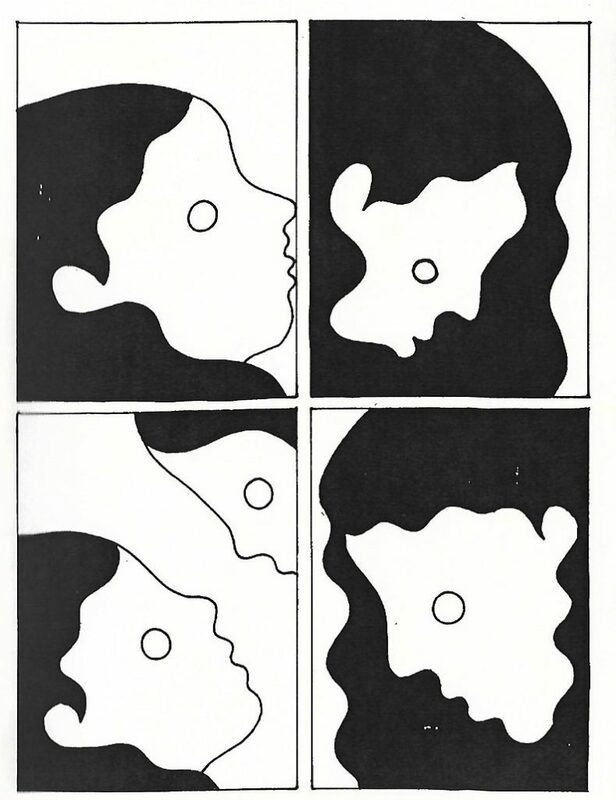 On the first page, with negative space behind them, there’s a sense of longing or desire; on the second, with that negative space filled in with black, desire gives way to judgement and shame. Despite the precise way in which images change in this book, the construction of panels and pages drip and ooze with small imperfections; it’s hard to say if this is due to the book’s printing, or if it’s an intentional aspect of the comic. Either way, the juxtaposition between extremely tightly controlled panels and their sloppy edges gives the comic a raw energy. Escape Route doesn’t seem to act as advertised – this comic is a maze. Each page turn leads you deeper and deeper into a strange and mystical place. Respite can only come when the final page is turned.